It’s not hard to get psyched up about the idea to learn to fly a wingsuit – especially when those viral videos make it look so incredibly fun and exciting. If you’re sizing up the idea of going from wingsuit zero to wingsuit hero, you might want to know exactly what kind of path lies ahead of you. Wingsuits work using principles similar to those of every other human-made airfoil, from fighter planes to paragliders. A wingsuit is, at its heart, an airfoil built around a person – so, just like planes and paragliders, the pilot needs to learn how to fly it. It is not as easy as it might look to control one of these babies. You’ll need loads of experience, solid gear and great instruction to earn your wings – and we’re here to help. Let’s touch on a few basic questions first, though, shall we? 1. How much skydiving experience do you need to wingsuit? To start flying a wingsuit, your first stop will be a skydiving First Jump Course with the eventual goal of earning your entry-level solo skydiving license. (That means that – in the United States – you’ll have to prove with a photo ID that you’re over 18 years of age.) Even that is a pretty huge challenge – but you’ll have quite a few more hoops to jump through after it. The United States Parachute Association recommends that each person making their first wingsuit skydive have made at least 200 jumps in the past 18 months. If you’ve logged fewer than that recommended number of jumps, you’ll have a dickens of a time finding any worthwhile teacher. It’s serious stuff! Signing up for a well-administered first wingsuit jump course (FWJC) at the proper time in your skydiving career isn’t just smart from the perspective of safety. It will also ensure that you aren’t overburdened with newbie concerns when you make that jump, which will significantly improve your relationship with the challenge presented by the wingsuit. Taking this process step by step is vital, and we can be with you from the very beginning of your journey. Every manufacturer – because, y’know, capitalism – insists that their wingsuits deliver the best glide, start flying the quickest and clocks in as the fastest suit in the atmosphere. That might make you think that you’re buying, like, a car, and that you can just hop in and smash the gas and it’ll do what you want. Nothing could be further from the truth. Putting in the jumps before you put on the suit might just save your life. Finding the right wingsuit is paramount. 2. What does it cost to learn to fly a wingsuit? By the time you have the requisite skydiving experience to begin your wingsuiting education, you’ll own your own parachuting equipment (which at the minimum will include a container, a main parachute, a reserve parachute, an automatic activation device, at least one altimeter and a helmet). Purchasing that gear, even used, represents a pretty significant investment. 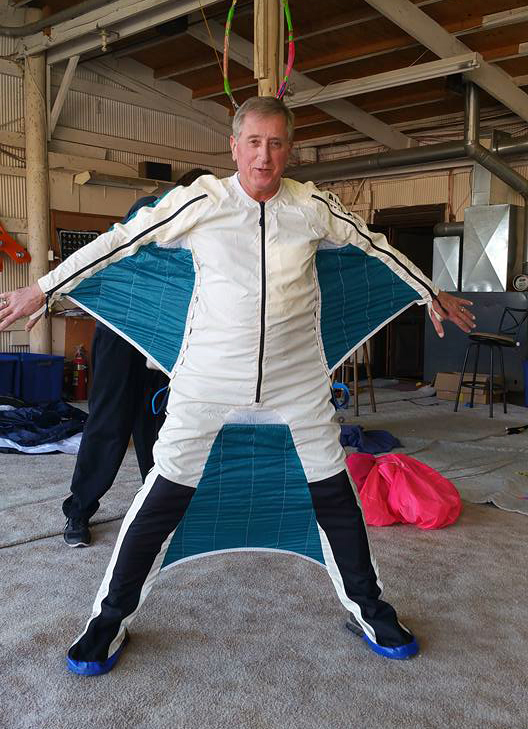 While you are welcome to fly a previously-purchased wingsuit at your first wingsuit jump course (FWJC), most instructors will suggest that you use a student suit that they provide for this purpose. Once you learn to fly a student suit well, you’ll be able to make more informed decisions regarding what suit to purchase for yourself. 3. How different is a wingsuit skydive from a “normal” skydive? A “normal” skydiver can manipulate the surfaces of her body to change her heading and freefall speed, but she’s still basically falling, for all intents and purposes. A wingsuit, on the other hand, turns her body into an (albeit comparatively low-efficiency) airfoil, creating a combination of the aerodynamic forces of lift and drag that she can use to move herself around the sky in a much more horizontal manner. A skydive is usually performed from around 12,000 feet over the landing area, and wingsuiters often deploy their main parachutes 9,000 feet (3 kilometers) below that altitude. If she’s flying at the respectable glide ratio of 2.5:1, that wingsuit pilot will be able to cover about 7.5 kilometers of distance. If she’s not watching where she’s going, she could end up very, very far from the dropzone. 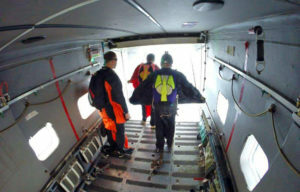 A “normal” skydiver is much less likely to wander off so far – but a “normal” skydive also doesn’t last nearly as long. Do you still want a taste of human flight? Let’s get started! At WNY Skydiving, we’ve helped lots of wingsuit hopefuls earn their wings in our school, and we’re looking forward to helping you earn yours. Get in touch with us today!